Reform Judaism might have been the ultimate Dead White Guy club. While your average Reform Jew probably doesn’t know who Geiger, Holdheim, Zunz, and Jacobson were (a really great law firm? ), close to two centuries after their radical notions were introduced into Judaism, we are still dealing with the implications of how Judaism deals with such (originally) non-Jewish concepts of rationality, reason, and logic. We owe many debts of gratitude to these founders of Reform Judaism, but we may also be held captive by some of their ideas. For the early Reformers, the ultimate authorities on decisions of religious importance were these “immutable” laws of rationality, reason, and logic. The sh’ma was a prime target for attempts at expunging any perceived irrational theology from our liturgy. References to divine reward and punishment? Out! Commandments to distinguish ourselves in dress by wearing tzitzit? Out! Notions of divine control over natural weather patterns? Out! What was left was a very nice catechism on the oneness of God – a perfect watchword of our faith that might be easier for the wider world to digest. But as I’ve talked about before, not everything we do is really held up to this standard anymore. And for me, this is a great evolution. When everything is rational; when everything makes sense; when everything is smooth and polished in perfection, we stop thinking. It becomes easier to glide through life without thinking about our actions. When everything is simple and easy and clean, we are robbed of opportunities for kavannah. 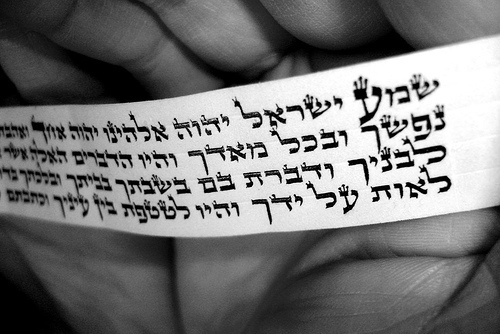 In the quest for spirituality, many previously rejected “irrational” aspects of Judaism have been re-embraced in Reform. But one hundred and some fifty odd years later, the sh’ma looks more or less the same in Reform siddurim, not keeping fully apace with our irrational evolution. There is, of course, the notable exception of the passages on the tallit being reintroduced in Mishkan T’filah, reflecting the change in approach to wearing tallitot among Reform Jews. With this idea in mind, might there be a way to reframe the challenging aspects of the sh’ma so that it can be both a declaration of our belief in the oneness of God, as well as our supreme belief in humanity’s need to be responsible for our actions on a cosmic level? Wouldn’t that be quite the watchword?